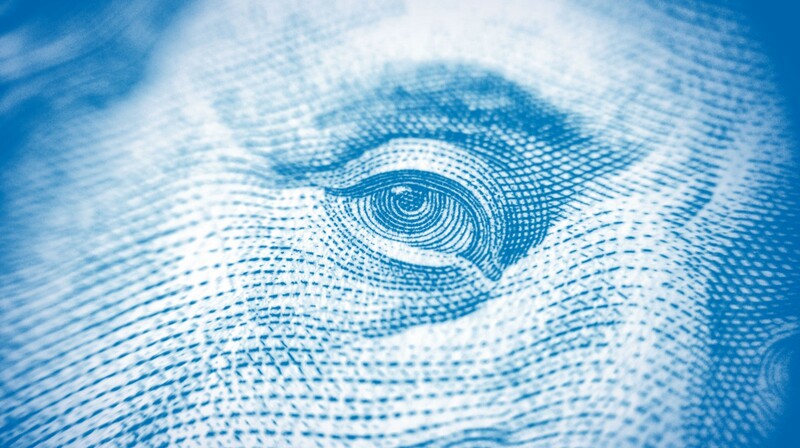 Not Just Money: Where is the Money Going? Today, Helicon Collaborative released Not Just Money: Equity Issues in Cultural Philanthropy, a research study conducted with funding from the Surdna Foundation. The study continues our examination of inequities in arts funding in the U.S., starting with Fusing Art, Culture and Social Change in 2011, published by the National Committee for Responsive Philanthropy. Not Just Money looks at the picture now, to see what has changed in that time. Spoiler alert: despite important efforts by many leading foundations, funding overall has gotten less equitable, not more. This means that cultural philanthropy is not effectively — or equitably — supporting our evolving cultural landscape. Here we share some of our key research findings. This first post explores inequitable patterns in funding distribution at national and local levels; the second looks at the lack of diversity among decision-makers (arts foundation staff and boards, individual donors and cultural institution leadership) and distinct challenges faced by organizations of color and those serving low-income communities in both urban and rural communities; and the final one suggests how we might begin to move toward a new era of more equitable and inclusive cultural philanthropy. We know there are many in the sector who want change. We hope that this data will give arts funders and cultural leaders the basis on which to undertake bolder, and more collaborative efforts to change the policies and practices that maintain an unfair status quo. Changing this system will require ideas and actions from many corners — we certainly don’t have all of the answers. We invite you to share your ideas on how to move forward here and on Twitter using #notjustmoney. Click here for the full report, downloadable graphics, city profiles, email sign up, and more. 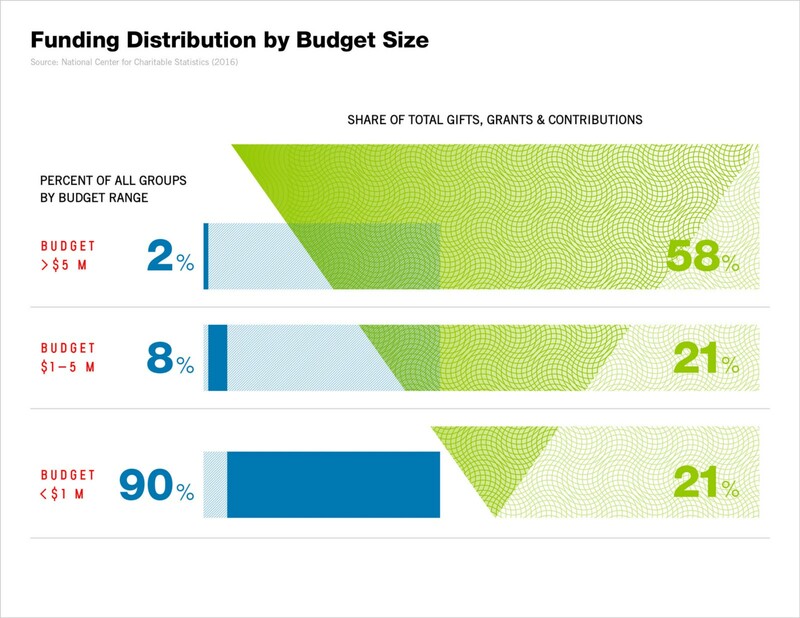 Research findings are based on the most robust data on cultural philanthropy available from DataArts, Foundation Center (FC), Lilly School of Philanthropy and National Center for Charitable Statistics (NCCS). The patterns that emerged from these different datasets were remarkably consistent. The data review was supplemented with a scan of relevant research and interviews with a range of funders and field leaders. The research generated six key findings. Finding #1: Arts foundations and nonprofit leaders are increasingly aware of diversity, equity and inclusion issues in the nonprofit cultural sector. In recent years, growing numbers of arts foundations have become concerned about the lack of diversity, equity and inclusion in the nonprofit cultural sector. This awareness has been spurred, in part, by national conversations about economic inequality, racism, LGBTQ rights, class bias and various kinds of unexamined privilege in society overall. In particular, the Black Lives Matter movement and the 2016 presidential campaign have been important contributors to sparking consciousness. New research on issues related to diversity in the sector, including reports commissioned by the Andrew W. Mellon Foundation and New York City Department of Cultural Affairs. Enrich Chicago — a group of foundations and cultural organizations in Chicago that has developed a set of common objectives to increase funding for organizations based in African, Latinx, Asian, Arab and Native American traditions, and to sponsor research and internships to advance those goals. The Racial Equity Funders Collaborative in the Twin Cities, which is working to build knowledge, remove barriers to equity in grantmaking, and support initiatives to advance community-based philanthropy. Their efforts include a project to boost theaters of color in the region. Finding #2: But despite these efforts, funding is getting less equitable. Very few organizations of color or cultural groups based in low-income communities are included in this large-budget group. Across the nation, fewer than 50 cultural organizations whose missions focus primarily on artistic traditions from Africa, Asia, Latin America, the Middle East and Native America, or that focus primarily on reaching rural populations and low-income communities, receive enough funding to maintain budgets of $5 million/year. As the portion of funding to the largest institutions has increased, the portion to smaller groups has declined. The disparities in funding are even starker for some cultural groups and communities. For example, while approximately 20 percent of Americans live in rural communities, less than 2 percent of arts foundation funding goes to cultural groups in these places. People of color represent 37 percent of the population, but just 4 percent of all foundation arts funding is allocated to groups whose primary mission is to serve communities of color. Finding #3: The inequities are systemic, and local funding patterns mirror national ones. Helicon looked at ten cities that have among the highest levels of giving to the arts: Boston, Chicago, Detroit, Los Angeles, Philadelphia, Pittsburgh, New York City, San Francisco, the Twin Cities and Washington, DC. At local levels, too, arts funding is highly concentrated in the hands of relatively few large institutions. 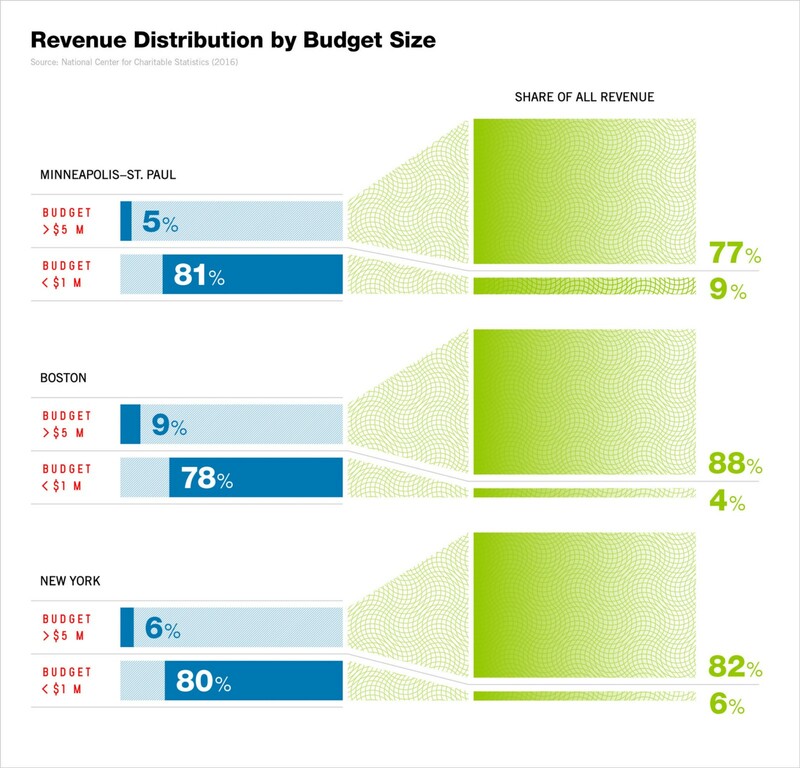 In 2015, for example, 22 groups in Boston — those with budgets over $5 million — received close to 90 percent of all arts gifts, grants and contributions, while the 198 groups with budgets under $1 million received less than 5 percent. Similarly, in the Twin Cities, 23 groups with budgets over $5 million received 77 percent of all contributions while 345 groups with budgets under $1 million received 9 percent. Even when the city’s population is very diverse, including places with “majority minority” populations, cultural philanthropy does not allocate significant sums to cultural organizations dedicated primarily to serving these communities. In seven of the cities Helicon studied, the proportion of funding going to groups focused on low-income communities and communities of color is less than 10 percent. This is true even in cities where the number of cultural organizations focused primarily on serving such communities nears 25 percent of the population of all local cultural groups. In Los Angeles, for example, whose population is more than 72 percent people of color and where 24 percent of the city’s cultural groups self-identify as focusing primarily on communities of color, low-income populations, LGBTQ populations or people with disabilities, just 8 percent of all arts foundation goes directly to such groups. Finding #4: San Francisco shows that sustained and systemic efforts can make a difference. The notable exception to the general patterns is San Francisco, where two decades of intentional and collaborative work to boost mid-sized and smaller cultural organizations and increase cultural equity — by both public sector funders and private foundations such as the Walter and Elise Haas Fund, James Irvine Foundation and Hewlett Foundation — has produced funding distribution patterns that more closely reflect the city’s demographic profile and the diversity of the local cultural sector. (See: San Francisco Administrative Code §68, Cultural Equity Endowment Fund.) As part of these efforts, for example, between 2009 and 2014 approximately $11 million was distributed to small and mid-sized groups by re-granting programs sponsored by the Alliance for California Traditional Arts, Theater Bay Area/Dancers Group, the Haas Fund and others. (Sustain Arts) As a result of these intentional strategies, not only does San Francisco have more diverse nonprofit cultural groups per capita than other cities, those groups also receive a significantly larger share of arts foundation funding than their counterparts in the other urban areas we studied. 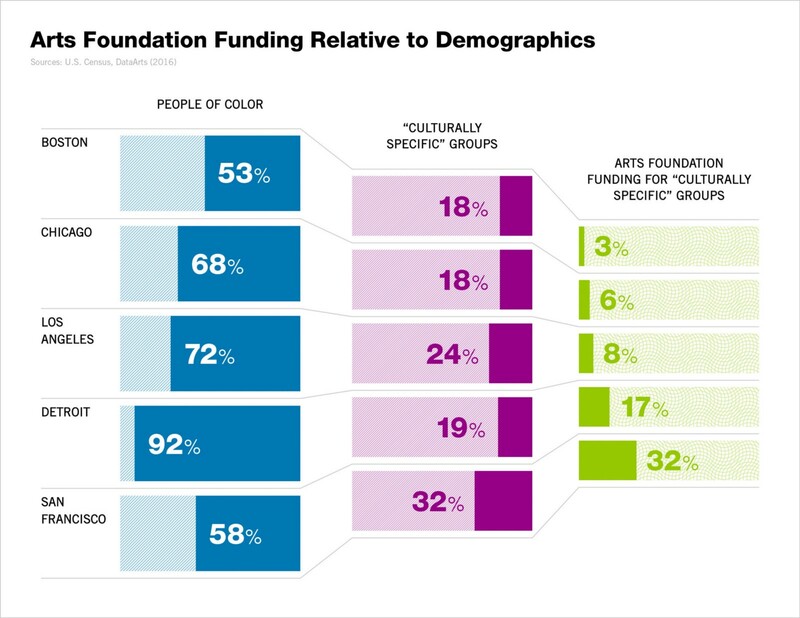 In our next post, “Who is Making the Decisions?”, we share findings about the demographics of arts foundation leadership, the distribution of giving to the arts by individuals, and the distinct challenges faced by cultural groups that focus primarily on communities of color, low-income communities, LGBTQ populations or disabled communities. We work to enhance and mobilize the power of culture to contribute to a more just, sustainable and beautiful world for all people. This is a space to share our research and further the conversations around arts and culture funding and equity.